"I'll thee protect from all the story's ghosts, for I'm the one who'll thrill they soul the most." I love Shakespeare in all of his wonderful, iambic pentameter. I've had the privilege of growing up surrounded by a father who believes in the power of the written and spoken word; I'm even named after one of Shakespeare's characters. So it was pretty much a given that I would devour this collection of reimagined pop songs, and I wasn't disappointed. Didriksen does the Bard proud with his creations. Every song is a fun adventure; whether you're familiar with the song, or not. 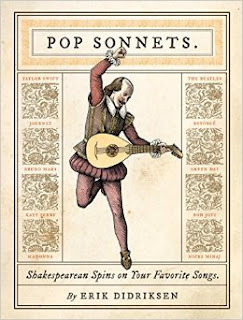 I particularly enjoyed trying to guess which song each sonnet was based off of as I read them. Yes, some of the sonnets were more well rounded and composed than others, but all of them together made for an entertaining read. This is a book I would like to add to my library, and one which I can see myself picking up at random moments to read a sonnet or three.